The smell of deep fried turkeys cooking filled the air in downtown Williamston Wednesday morning as volunteers from area churches joined Christian Men United in Prayer in Mineral Spring Park to cook 225 turkey breasts. 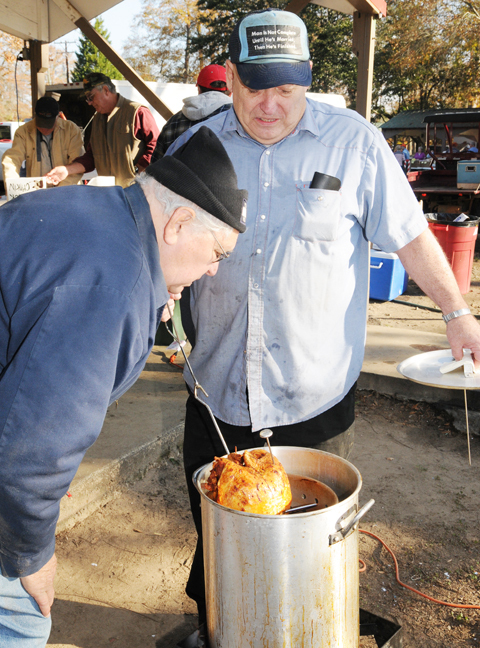 Jim Davis (left) and Walter Davis check the temperature of one of the frying turkeys. As part of a Thanksgiving outreach, volunteers cooked turkeys and packed boxes with canned good which provided a Thanksgiving meal for approximately 200 area families.